Whether it’s for maximum comfort or bare minimum to survive, every hiker should have the best survival tent for their specific needs. I’m a huge fan of Naked and Afraid. If you’ve never seen it, it’s a survival show on Discovery where people are stripped of everything — clothes included — and dropped into some of the harshest environments on earth. The shelters the survivalists build rival exceed anything I could build myself, yet there’s no doubt the contestants would be much better off if they had a basic survival tent. While casual campers undoubtedly enjoy finding the roomiest, most comfortable tents outfitted with some of modern society’s creature comforts, what’s often forgotten is that the tent itself is a piece of survival gear. The type of tent you need varies depending on the type of usage it will get — car camping vs minimalist backpacking — so what characterizes the best survival tent? Note: “Best Survival Tent” is a subjective phrase. It depends on your specific situation: where you’re hiking, the time of year, how many people you’re with, how much gear you have, etc. For that reason I didn’t rank from best to worst. Instead, I aggregated my top picks by tent capacity (number of people) and made sure to cover all types of environments. Click here to skip to the best survival tent reviews. Please note that here I’m truly talking about survival. If you want to buy a huge 8-person tent with a guest bedroom and solarium, be my guest! But for the purposes of this article I want to address the minimum requirements for survival. The best survival tent for fall in the Pacific Northwest will be different than the best survival tent for summer in the American Southwest. But while you’ll want to consider your specific needs, there are a few universal survival tent truths. My two-person grab-and-go tent for beach camping comes in a 6″ x 24″ bag with a handle on it, and it weighs about 5 pounds. It’s cheap and does the job, but I wouldn’t want to lug it around on the trail for use in survival situations. It takes up way too much space for the limited warmth and weather protection. More rain resistant tents tend to be bulkier. While you don’t need a heavy-duty, all seasons tent that can withstand 132 mph hurricane force winds if you’ll be hiking in New Mexico, you’ll probably need something a little heftier for a few days in Oregon. Unless you plan on thru-hiking for a whole season, in which case you’ll need to pay a premium for a great survival tent, you probably have an idea of the general weather conditions for the specific time and place you’ll be hiking. Match your tent’s weather resistance to those conditions, and remember to plan conservatively and expect the worst. Survival situations often are marked by needing to do a lot of things in a short period of time or by the sudden onset of adverse weather conditions. The last thing you need is to spend a ton of time setting up your tent. The best survival tents will prop up quickly and easily. Geodesic tents provide great protection from the elements but can be more challenging to set up. Dome tents can be incredibly easy to set up but often provide less protection in poor conditions. There are pros and cons to each type of tent. If your survival tent rips or breaks, it could be game over. Quality vs cost is a buyer’s decision we each must make on our own, but I’m of the opinion that you don’t skimp on something as important as survival shelter. Like I said above, my beach camping tent is a cheap piece of crap that keeps the bugs out. That’s all I need it to do. You need a good survival tent to do a lot more than that, and you need to be positive that it’ll be up to the task. The above characteristics of survival tents are pretty broad and designed to get you thinking about the best survival tent for your needs. In this section I want to give you a few additional specifics to consider. When you’re looking at survival tents that can withstand storms, you’ll want to give extra consideration to the base of the tent. For example, you may also want to look at tents with a bathtub floor. A bathtub floor extends the waterproof material from the base of the tent up a few inches around the side walls. This prevents water from leaking in through seams around the base. Not a ton of mystery here — do you want a tent with one or two walls sealing the elements off? Single-walled tents traditionally were made with thicker weatherproof material that did their best to keep wind and water out, but modern materials are allowing manufacturers to think lighter while still achieving a lot of the simplicity that single-walled tents allow. Double-walled tents tend to be made up of an inner tent that isn’t very weatherproof surrounded by a rainfly or other protective layer. Generally you’ll be choosing between aluminum or fiberglass (unless the tent doesn’t come with poles). Stakes can make or break your survival tent — they’re what will keep everything where it should be, which is often the difference between dry/comfortable and wet/miserable. With stakes we’ll want to consider two features: material and shape. Did You Know? Y-beam stakes have the most surface area, which is why they have the most holding power in loose soil. But that extra surface area comes at a price: more weight. Just like stakes above, guylines are an oft-overlooked but crucial part of a good survival tent, especially if you’re going with a double-walled tent in a wet environment. They come in a variety of materials from natural fibers to Paracord to Zing-it line. My preference? Paracord offers a great combination of light weight and strength, which is perfect for survival situations. For our purposes, storage includes both inside and outside the tent. Let’s start with outside, because I can almost hear you saying, “Storage outside my tent? What does that mean?” Glad you asked! Many survival tents with a rainfly and guyline system are designed to provide a protected area that extends just beyond the entrance to the tent. This can be great for keeping items dry that you don’t want to bring inside the tent. Inside the tent is much simpler: we’re talking about pockets and compartments. If you’re on a multi-day backpacking trip, this may be valuable to you. Sometimes it’s just you. Sometimes it’s you and your significant other (dogs included). Sometimes it’s you and the whole gang. Is everyone going to be in one tent? Will there be multiple tents? As mentioned umpteen times already, there isn’t any one “best survival tent” — it totally depends on where you’ll be and what your needs are. With that understanding, let’s take a look at some of the best survival tents according to me, The Outdoor Authority. Note: Tents ordered from 1-person to 4-person tents, not necessarily ranked according to “best survival tent” due to the paragraph above — it depends on your needs! The Snugpak Ionosphere is a fantastic survival tent. It accommodates 1 person (2 in an emergency) and pitches quickly with a 2 pole, 1 door design. It’s a double-walled tent. The interior is bug-proof and features a bathtub bottom to seal out rainwater. The exterior is a high quality rainfly with a 5000mm rated polyurethane laminate coating that makes it both windproof and rainproof. However, the rainfly does fit snugly around the exterior, which means no extra vestibules or sections outside the inner layer to safely store your bags. The tent also comes with 2 curved, anodised aluminum poles, 16 ultralight aluminum stakes, and 1 repair kit. For additional details, check out SnugPak’s info sheet. While the inside has more than enough room for one person to rest comfortably, it definitely isn’t as roomy as other tents. Unless you have crippling claustrophobia that shouldn’t be an issues. In my book this is the best survival tent for 1 person. Similar in design to the SnugPak Ionosphere above, the Winterial bivy tent generally is a more affordable option without the same quality and weather rating. Its rainfly is rated 3000mm versus the Ionosphere’s 5000mm rating, though Winterial’s base does have a 5000mm rating. However, this bivy tent does have the bathtub bottom. It comes with 2 curved aluminum poles and 14 aluminum stakes but no repair kit. Its trail weight is slightly less than the Ionosphere. If you’re still reading, you’ll love this ultralight, ultra-minimalist design. It weighs under 2 lbs on the trail yet has an amazing amount of floor space to comfortably fit 2 people. However, it doesn’t stand up well to adverse weather conditions (read: heavy rain) with its floorless design and only 1500mm rated rainfly. If you watched that video you’ll note the reviewer mentions a raging thunderstorm that hit overnight when he left the tent set up, and the tent carnage in the aftermath is enough to make most prospective buyer’s run for the next best survival tent on our list. But you have to understand what this tent is — it’s not an all-weather tent. It’s a minimalist tent meant for compact survival. There are trade-offs when going minimalist, and stability in strong storms is one of them with the Nemo Spike 2. If you want something sturdier for 2 people, check out the next tent on this list. A 4 seasons survival tent built to withstand all conditions, The North Face Alpine Guide is the best survival tent if you’re willing to pack the 5+ lbs of weight. The large front vestibule can easily store the bulkiest of backpacking equipment, and the tent features an entry doorway and a rear escape hatch for easy exit and/or ventilation. Made from high quality components, this tent lives up to The North Face’s reputation. If you’re simply looking for emergency survival, you probably don’t need a tent this robust. But if you want to ensure you can survive any conditions Mother Nature may throw at you, your search ends here. Another survival tent, another military grade SnugPak option. This Snugpak Scorpion 3-person tent features a near-identical design to The North Face Alpine Guide above — dome tent with large front vestibule — except it’s designed for 3 people. With 50-denier nylon (compared to the max 40-denier nylon used in the Alpine Guide) and a 5000mm rated rainfly, SnugPak once again proves it makes beastly survival tents that can withstand all conditions. However, that again comes with more weight. The Scorpion 3 comes with 10 internal mesh pockets, 3 featherlight anodised aluminum poles, 20 Y-beam aluminum alloy stakes, and 1 repair kit. Of particular note when packing this tent away is the poles are only 16 inches long. Some competitor poles are a full 24 inches. You can find the Scorpion 3’s info sheet here. If you’ve never heard of Mons Peak IX, they make some seriously quality stuff. All exterior materials are 40-denier nylon, which equals what The North Face uses but falls short of SnugPak’s 50-denier nylon. The poles are unbelievably light yet amazingly durable. The tent also comes with 12 aluminum Y-stakes, 4 reflective guylines, and a repair kit. With max 1500mm rated materials, this tent is not the most weatherproof. If being protected in heavy wind/rain and seriously cold temperatures is important to you, go with one of the smaller SnugPak tents above or the 4-person The North Face VE-25 tent below. They all have superior weather ratings. Where the Mons Peak IX Trail 43 makes its name is on lightweight, compact, durable protection. Designed for the coldest of the cold, The North Face VE-25 survival tent is a 4-person, 4-season behemoth of warmth and weather protection. The base of the tent is made from 70-denier nylon with a 10,000mm rating while the rainfly is 75-denier made from 1500mm rated nylon. Sure, the 1500mm rating pales in comparison to the Snugpak’s 5000mm rainfly, but the 75-denier material used on this tent beats Snugpak’s 50-denier material handily. Perhaps most impressive of all, the VE-25 is designed and tested to protect you in temperatures as cold as -60ºF. Yes, you read that correctly. That’s some Mount Everest level cold. 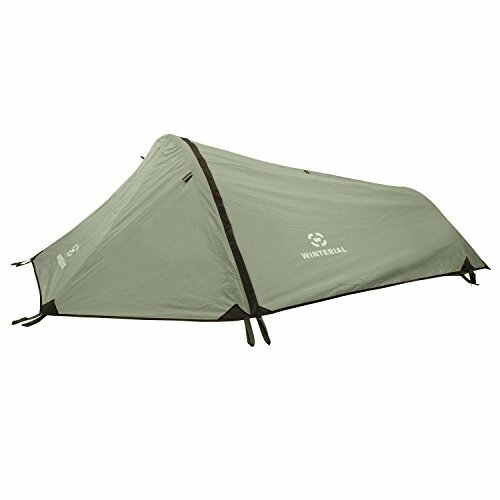 If you’re camping in the cold and need durability, this is the tent for you. Do you have another candidate for the title of best survival tent? Have you used any of the tents listed above. Let us know below!